In continuation of the first successful Bonus Miles Flotilla that took part last year, North Sailing announces Bonus Miles Flotilla 2018. This year’s goal is, starting from Keramoti’s port, to cross Dodekanesa (Lemnos, Lesvos, Chios, Samos, Ikaria, Kalymnos, Kos) intending to go as south as possible at Symi’s or even Rhode’s island. The final route will be decided on the skippers meeting during the intermediary stops of the crew depending the current weather conditions. You can consider your participation, bearing in mind that there is a ferry boat connection between Kavala-Lemnos-Lesvos-Chios. Prices vary depending on the type of the boat. Inquire us about offers. -Total cleaning: 3cab. Boat 80€ / 4cab. Boat 100€ / 5cab. Boat 120€/ catamaran 140€. 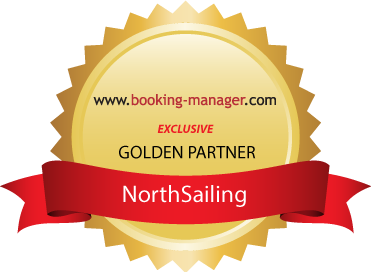 350€/person: Participation fees for individuals with stay in a double cabin with a co-passenger. Whoever wishes to stay in a double cabin without a co-passenger must pay twice the participation fees. The price includes: boat, port taxes, one set of linen towels, certificate of miles crossed. Extra: The fuels of each boat are not included in the price and are paid by its crew. Participation with obtainment of a skipper diploma up to 24 miles. For new sailing enthusiasts who want to seize BONUS Miles Flotilla’s opportunity which’s goal is their training, the total cost is 550€. Both theoretical and practical lessons are going to take place during the trip. Exams will be held on the final day of the trip and students will obtain a diploma of sailing boats up to 24 meters without mile restrictions, recognized internationally. For sailing enthusiasts who already have a diploma and want to expand their knowledge by obtaining an advanced diploma, the same price stands.